Cecil Juanarena was born on June 14, 1924, in Butte County, California. He enlisted in the U.S. Army Reserve on November 17, 1942, and entered the Aviation Cadet Program of the U.S. Army Air Forces on February 19, 1943, receiving his commission as a 2d Lt and his pilot wings at Luke Field, Arizona, on April 15, 1944. Lt Juanarena next completed P-47 Thunderbolt transition training before serving as a P-47 pilot in France from August 1944 to August 1945, during which time he flew 74 combat missions over Europe. After returning to the U.S., he left active duty and joined the Air Force Reserve on October 13, 1945, and was recalled to active duty on November 20, 1950. 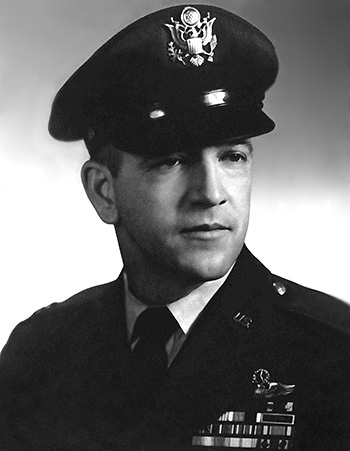 His next assignment was as a TF-51 Mustang instructor pilot at Tyndall AFB, Florida, followed by interceptor training and F-86 Sabre training. He served as an F-86 instructor pilot in Japan from March 1955 to September 1956, and then served as an F-100 Super Sabre pilot with the 532nd Fighter Day Squadron at Seymour Johnson AFB, North Carolina, from October 1956 to December 1957. Capt Juanarena then served as an F-100 pilot with the 333rd Tactical Fighter Squadron at Seymour Johnson AFB from December 1957 to September 1960, followed by Air Command and Staff College at Maxwell AFB, Alabama, from September 1960 to June 1961. His next assignment was as an F-105 Thunderchief pilot with the 7th and 9th Tactical Fighter Squadrons and the 49th Tactical Fighter Wing at Spangdahlem AB, West Germany, from August 1961 to August 1964, and then as an F-105 pilot with the 469th Tactical Fighter Squadron at McConnell AFB, Kansas, from September 1964 to October 1965, during which time he deployed to Southeast Asia from February to March 1965. Maj Juanarena served as an F-105 pilot with the 354th Tactical Fighter Squadron at McConnell AFB from October to November 1965, and then deployed to Takhli Royal Thai AFB, Thailand, from December 1965 to June 1966, during which time he flew 126 combat missions in Southeast Asia. His next assignment was on the staff of Headquarters Tactical Air Command at Langley AFB, Virginia, from August 1966 to August 1969, followed by service as Director of Operations and Training with 16th Air Force at Torrejon AB, Spain, from August 1969 to July 1970. Col Juanarena served as Deputy Commander for Operations of the 406th Tactical Fighter Training Group at Zaragoza AB, Spain, from July 1970 to July 1971, and then as Deputy Base Commander, 406th Combat Support Group, and Zaragoza AB, from July 1971 to July 1974. His final assignment was with the Inspector General Group at Luke AFB, Arizona, from July 1974 until his retirement from the Air Force on September 15, 1975. Cecil Juanarena died on January 31, 1976, and was buried at the Veterans Cemetery in Chico, California. Major Cecil B. Juanarena distinguished himself by heroism while participating in aerial flight as a combat aircrew member in Southeast Asia on 31 May 1966. On that date, while under intense and accurate fire from unfriendly forces, Major Juanarena demonstrated cool courage, undaunted determination, and superior skill in pressing home devastating air attacks against hostile positions. Persevering in the face of danger and death, he relentlessly and effectively aided in neutralizing the hostile forces. Major Juanarena displayed outstanding heroism and devotion to duty and reflected great credit upon himself and the United States Air Force.